"Who dat?" 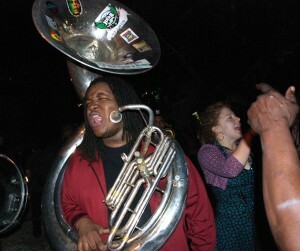 yells a tuba player from The Hustler Brass Band. That chant was everywhere. 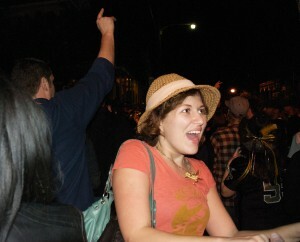 During one of my favorite moments, a police car passed through the crowd, and the cops yelled it from their megaphone. It sounds like a cliché, but the scene was a complete mixture of young and old and black and white. 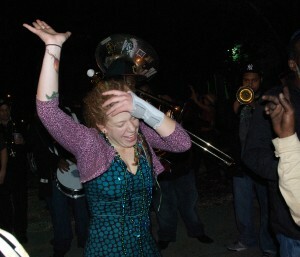 There was a loud, brassy band leading a second line through the narrow streets, and when it stopped, the scene turned into a happy swarm of dancing and shouting bodies. People were swigging beers and huffing laughing gas-filled balloons, and I was torn, as part of me wanted to be as altered as they were (OK, minus the balloon thing), and part of me just wanted to watch. I felt as though I was in front of something massive and monumental, and I was. The question was whether I should document it or take part. But that actually resolved itself quickly. Every time I tried to dance and melt into the fold, something told me that this wasn’t my party. It was theirs. And I was fine with that. I got the biggest contact high, not off the whiffs of nitrous oxide and pot that were most definitely floating in air, but off everyone’s joy. I have never seen anything like that, where the energy is so potent and inexhaustible. 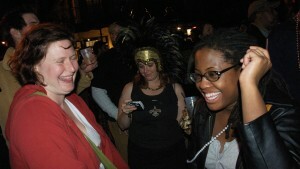 People were drunk and stoned, but hardly anyone was obnoxious. There was a heady magic in the air, something keeping anyone from spoiling the mood. 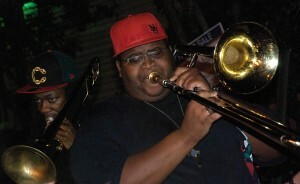 The music was loud and constant, and nearly everyone I saw looked captured by it. This wasn’t club dancing, where people dance to look cool. These people were dancing and shouting because, it seemed, they had to. 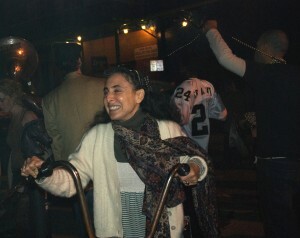 There was that girl, spinning fiery poi, and that couple who never took their eyes off of each other. And that other two-some, making out sloppily on the sidewalk. 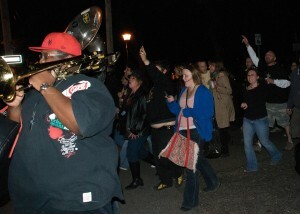 And that old, black man dancing close to the band by himself. And that white, hippie chick, with the dreads and the arm brace who was throwing her body around in that distinctive, sensual hippie dance way. It looked and felt like these people — and hundreds more — were all in this together. God, I love moments like that. 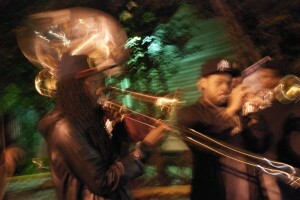 The Hustler Brass Band heads a second line toward Frenchmen Street after the Saints beat down the Vikings. 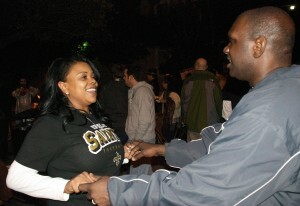 As I get ready to leave New Orleans soon, this memory actually gives me pause. I know that Sunday was no normal day and that I shouldn’t base any decisions on something as rare as what took place that night, but I can’t imagine that happening anywhere else. I have lived quite a few places and have seen many more, and I can honestly say that I have never experienced anything quite like that. I can’t imagine anywhere I have been partying that hard over anything. Not in the streets, not with spontaneous concerts, not with the police getting into the action too. And if you’re shaking your head right now and disagreeing with me, then I must not be explaining that night as well as I should, because I don’t think any place has what New Orleans does. This is another world. I know it has many problems, but it is so alive. How do you top that? I can’t help but let this question pick at me a bit. I’m not sure exactly where my next port of call will be, but I’m thinking Texas, maybe Austin. Everyone loves Austin, right? I have actually been there and had a good time. I kissed a boy and was nearly drowned in Barton Springs by a swan. But that’s another post, perhaps. Austin makes sense, and it seems cool and full of possibility and good movie theaters and writing opportunities. And my countrymen, Californians. But it’s not here — because nowhere else is. I’m guessing I’ll be OK with that, as I’ve only been here a week, and it’s not as though the city has taken me in like a mama hen or anything. I haven’t met my future husband or landed some great job. There is no practical reason to stay, but I’m still having a hard time leaving. The more I look around this town, the more I want to explore. Last night, a guy told me that this place is like the Wild West, and anything goes here. He makes his living selling pricey, homemade chocolates from a cart. He doesn’t make his confections in a commercial kitchen, and when he’s hassled by the cops, he simply wheels himself to the other side of town. That’s the kind of stuff that is possible here in this alternate reality I’m visiting. I like that. I guess it’s just hard for me to leave a place that feels so guttural, regardless of whether there’s a spot for me in it. I think I simply have to accept that. There’s no solving nor denying my feelings, and I don’t think there is any way for me to live here, either. I’m sure I could get by, working retail or food service or something else I’m not particularly good at, but I don’t want to. I need figure out where I’m supposed to be, and some sensible part of me is screaming that it’s not here. So it must be time to hook up my trailer and roll west. I have this sense that my experience of being seduced by this city isn’t uncommon. How could it be? How interesting it is to feel so lucky and sad at the same time.